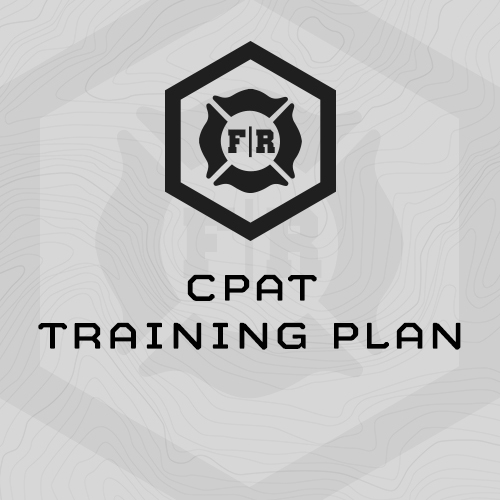 This 4-week, 5 day/week training cycle is specifically designed to improve performance on the Candidate Physical Ability Test (CPAT), the gateway physical fitness test for firefighters. You won’t be required to perform the actual CPAT, but rather a gym-friendly assessment designed to replicate the fitness demands required for the CPAT. You’ll take this assessment weeks 1 and 3, and complete follow-on progressions based upon your assessment results. Because of the assessment, this training plan automatically scales to the initial fitness of the athlete. In addition to CPAT-Specific exercises and progressions, the training also includes basic work capacity, core strength and grip strength work. - Access to a commercial gym which includes pull up bar, barbells, racks, bench, dumbbells, etc. Rest 3 min. between events. Complete the entire assessment with a 50# weight vest. (1) Max reps 50ft. shuttles in 1 min. w/ 50# vest Do not touch the line. Pivot with your foot. (2) Max reps Step-ups in 3 min. in 50# weight vest and 25# pack (75# total). (4) Max time Farmer’s Carry with 60# in each hand. You must stay moving the entire time. Don’t go past 3 min. (7) Max reps Partial Squats to Thrust w/ 60# Dumbbell in 1 min. (1) 5 Rounds, every 90 sec.